Bianca Keener rips one of her three hits for the Lady Railroaders in win over Fort Loramie. Maggie Manuel picks up a victory for the Lady Railroaders in run rule win over Fort Loramie. Rylee Canan picks up a hit for Bradford in run rule win over the Fort Loramie Lady Redskins. 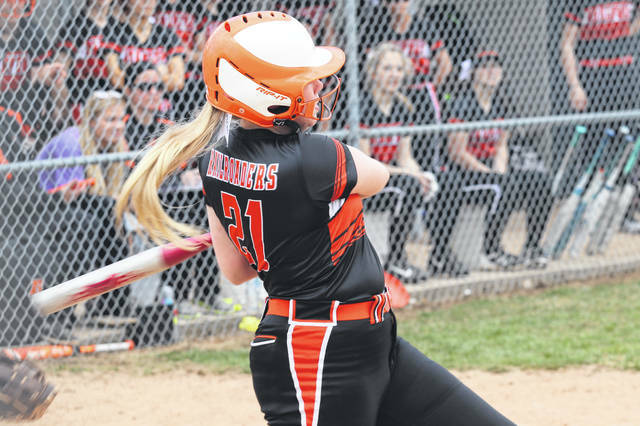 VERSAILLES – The Bradford Lady Railroaders run ruled the Fort Loramie Lady Redskins 15-5 in a Saturday afternoon game played on the Versailles Lady Tigers home field. The Lady Roaders used a Rylee Canan RBI single to get things rolling in the first on the team’s way to a 5-0 lead after one inning of play. Bradford plated seven runs in the top of the third inning to give the Lady Roaders a 12-0 lead. Singles by Bianca Keener, Maggie Manuel, and Emma Canan and Bianca Keener and a double off the bat of Rylee Canan paced the Lady Roaders third inning outburst. Fort Loramie scored a run in their half of the third and two runs in both the fourth and fifth innings but was not enough to keep Bradford from recording five inning run rule win with the Lady Railroaders adding a single run in the fourth and two runs in the fifth. Bradford pounded out 17-hits and committed 2-errors while the Lady Redskins were collecting nine hits and committing five errors in the non-conference game. Lady Roaders having a multi-hit game included: Bianca Keener going 3-4 with 3-RBIs and 2-runs scored. Maggie Manuel was 3-3 with 2-RBIs and 2-runs. Rylee Canan went 2-3 with 2-RBIs and 3-runs, Emma Canan was 3-4 with 2-RBIs and 2-runs and Abby Fike going 3-4 with an RBI and 3-runs scored. Manuel pitched a complete game in picking up the win for Bradford tossing five innings, allowing nine hits and five runs. 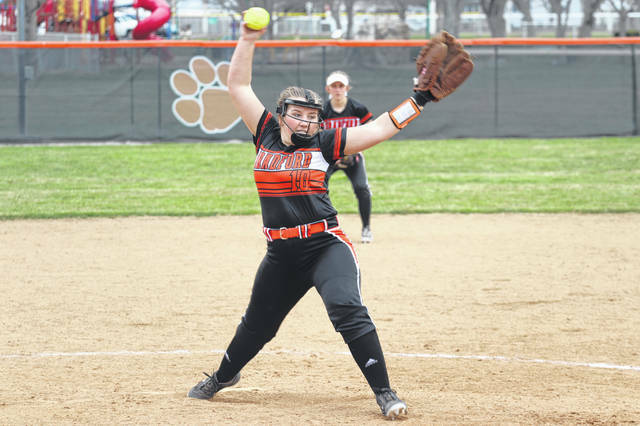 https://www.dailyadvocate.com/wp-content/uploads/sites/34/2019/04/web1_Bianca-Keener.jpgBianca Keener rips one of her three hits for the Lady Railroaders in win over Fort Loramie. https://www.dailyadvocate.com/wp-content/uploads/sites/34/2019/04/web1_Maggie-Manuel.jpgMaggie Manuel picks up a victory for the Lady Railroaders in run rule win over Fort Loramie. 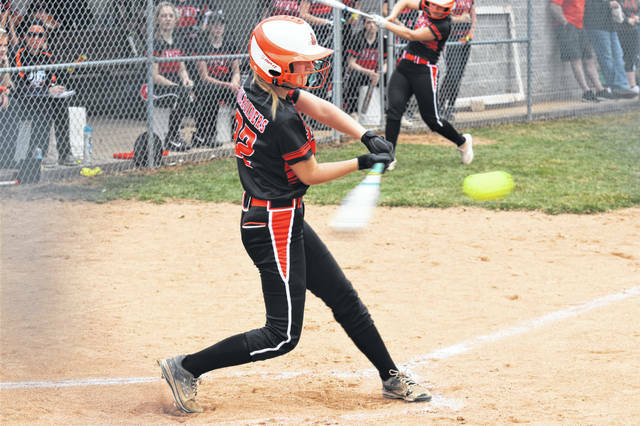 https://www.dailyadvocate.com/wp-content/uploads/sites/34/2019/04/web1_Rylee-Canan.jpgRylee Canan picks up a hit for Bradford in run rule win over the Fort Loramie Lady Redskins.